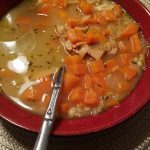 Whether it's cold outside or you're fighting a cold, this soup is a perfect meal to heat up your soul and fight that sickness. Onions, garlic, cayenne pepper, and broth are known to help make you feel better. Chop carrots, onion and garlic. Add to the pot. Shred rotisserie chicken into little pieces and add to the pot. Add split peas, salt, black and cayenne pepper, thyme, and sage. Stir soup and bring to a boil. When it has reached a boil, turn down the heat to a simmer. Simmer for at least 45 minutes or until carrots and split peas are tender. You can also let the soup simmer all day. Follow instructions on the package of quinoa and make on the side. When you are ready to serve, spoon quinoa into serving bowl and add soup on top. Such a yummy meal! Easy to make, flavorful AND healthy!! I will definitely be making this again soon. Thanks for the recipe!